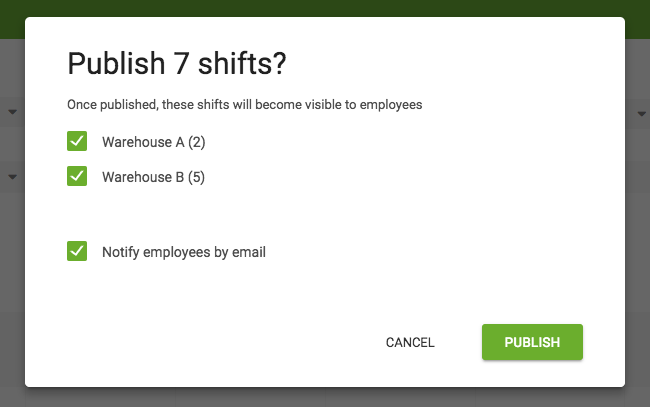 Same as with Timesheets module, you can control which employees can access Shift Scheduling functionality. By default no employees will have access to scheduling. This is so because employees who always work regular shifts probably don't need to see 'Schedule' tab in the sidebar menu. Firstly, you want to go to Settings > Scheduling > General, to adjust some basic settings. For example, adding a designated Scheduling administrator (person who will have access to Scheduling settings and reports), whether to allow employees to advise their availability, how you want time off requests to react when shifts are already scheduled on the selected dates, and other settings. Then you should move on the Settings > Scheduling > Schedule groups. 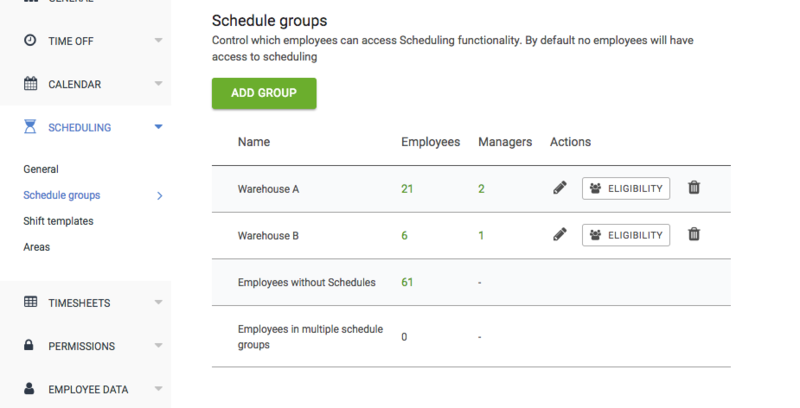 This is where you can specify groups/locations and select which employees belong to which group and who is the group manager (the person ultimately setting up schedules). For example, say you have two locations - Warehouse A and Warehouse B. Managers of Warehouse A scheduling group will not be able to plan and adjust shifts for employees working at Warehouse B. And to clarify, Scheduling Administrator will have access to make changes at any time for anyone. In addition, you can create areas (Settings > Scheduling > Areas) to identify a particular job or duty at a location. For example, you might have a location called "Dental clinic" where one area is called "Receptionists" and another one is "Dentists", etc. After going through all these settings you are now all set up to take full advantage of the Schedule planner in the side bar menu. Click on the + sign which you will see when hovering over any day of the week, select the desired shift template (or add a new type of shift) and simply click 'Add'. For copying the same shift to another day, simply press and hold Shift key on your keyboard, select the shift you want to copy and drag it to the desired date. To make planning easier, you can click on the diagram icon besides the date to view daily coverage and the larger diagram icon at the top to view weekly workload. Once you're happy with how everything looks you're ready to Publish the shifts!